Eric “Sarge” Jernigan stands next to his fire gear at Rural Metro Fire’s Station 26. Rural Metro Fire has its chief and its deputy chief. And assistant chiefs and battalion chiefs. It has captains. James Eric Jernigan is Sarge. 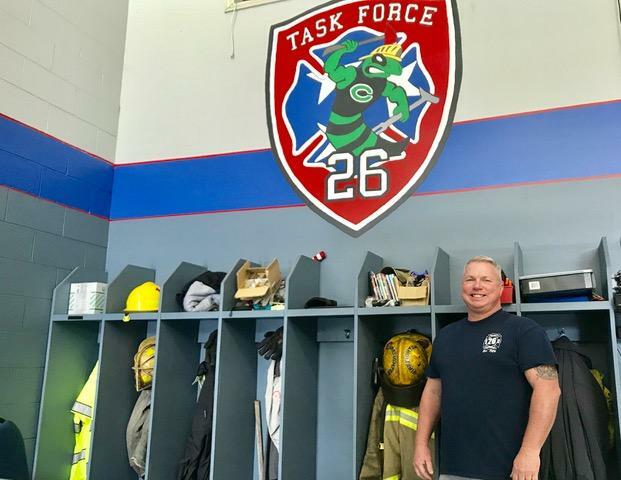 He’s a master firefighter and paramedic at Station 26 on Strawberry Plains Pike. He has been a fixture there for nine years and has been with Rural Metro since 1996. He lives two miles from the station, and he and his family are embedded in the Carter community. Wife Mindy works at Team Health and their son, Logan, 17, is a junior at Carter High School, where he plays football and baseball. Sarge and Mindy attend Trentville United Methodist Church, and Logan goes to Strawberry Plains United Methodist. Sarge, 49, earned his moniker from his days as a member of the U.S. Marine Corps, serving in Kuwait as part of Desert Storm in 1991 as a 21-year-old combat engineer. Being a combat engineer is dangerous work – he cleared minefields to make lanes in the sand for vehicles and troops. He returned to the Middle East as part of the Operation Iraqi Freedom campaign in 2007. He was then a Navy corpsman (combat medic) attached to the Marines. He retired in 2012 from the Naval Reserves as a Petty Officer 1st Class – an E-6 sergeant in the Army. “Sarge” has stuck. Jernigan’s father was in the U.S. Navy and stationed in Japan when Sarge was born in 1970. The family soon moved to Oak Ridge, and he was reared there, graduating from Oak Ridge High School and then Roane State Community College. He attended the University of Tennessee but opted to leave school and find a job. The job was with Child & Family Services at a treatment center for troubled teens. Interestingly, Logan Jernigan hopes to work in the area of special-needs education. Then an old friend suggested Jernigan become a firefighter/paramedic with Rural Metro. 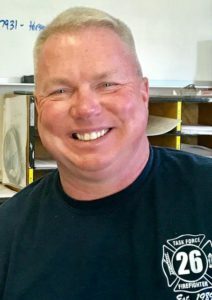 He graduated from the Fire Academy in 1996 and EMT School in 1997 and earned his paramedic certification in 2000. Jernigan describes himself as a humble man with no ego, a lover of his community, and at Rural Metro he focuses on teamwork. “I probably get the teamwork approach from the military,” he says. In his spare time, he’ll teach first aid and AED training to church groups, and he also enjoys working and volunteering at music festivals as a paramedic – at Bonnaroo, Hippie Jack’s near Livingston, Tenn., and the Muddy Riots motorcycle rally in Cookeville. He also loves camping and fly fishing.